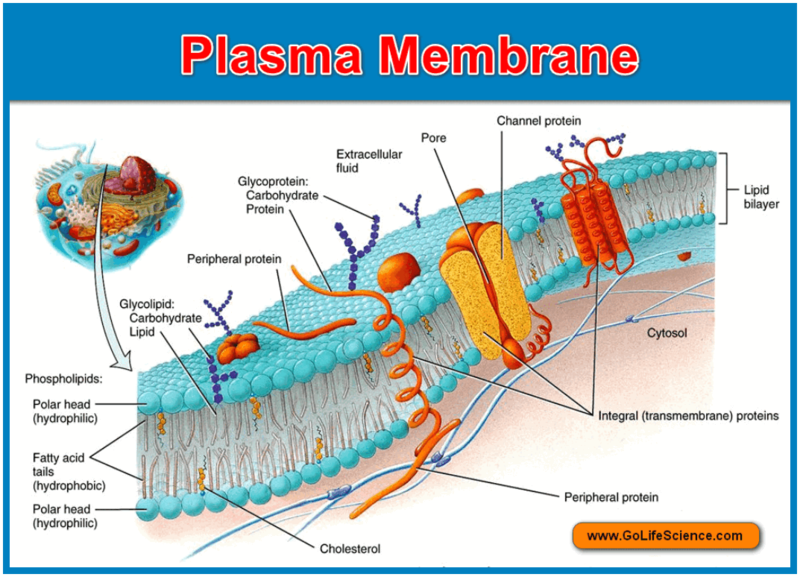 The Plasma membrane is considered to conform to the fluid mosaic model of the cell membrane proposed by singer and Nicholson. 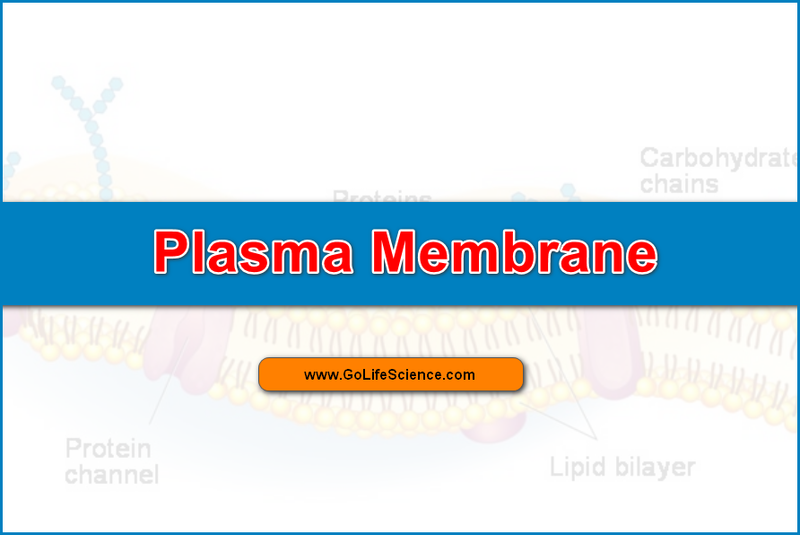 The membrane is composed of proteins, lipids, and carbohydrates. There is wide variation in the lipid-protein ratio between different cell membrane. Lipids are asymmetrically distributed within the bilayer of the membrane. The major lipid components of the membrane are phospholipids, cholesterol and galactolipids. Neutral phospholipids (phosphatidylcholine, phosphatidylserine, cardiolipin, phosphatidylglycerol, and sulpholipids) are also present in the membrane. The acidic phospholipids are negatively charged and are associated with proteins. The glycolipids occur in the outer half of the bilayer. The carbohydrates are in the form of glycolipids and glycoproteins. 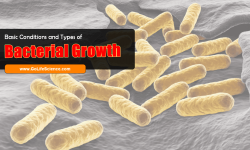 the glycoproteins are also confined exclusively to the outer surface of the membrane. This imparts an asymmetry to the membrane. 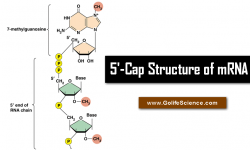 Sialic acid, fructose, hexose, and hexosamine are then carbohydrates bound to proteins.sialic acid residues, and carboxyl and phosphate groups produce a negative charge to the outer surface of the membrane. Membrane proteins are both peripheral and integral. Numerous enzymes, antigens and various kinds of receptor molecules present in the plasma membrane are proteins. Proteins not only form the structure of the membrane but also serve as carriers or channels for transport. Peripheral proteins are free of lipids. They can easily be separate with chelating agents or in high salting solutions (by any mild treatment). On the other hand, internal proteins (representing 70 percent of the membrane proteins) require drastic procedures for isolation. They are associated with lipids. 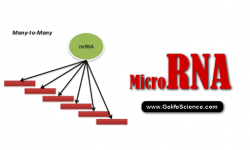 It is these proteins which form glycoproteins by attaching to oligosaccharides. The gross chemical constituents are 5% carbohydrates (glucose, hexosamine, fructose and sialic acid), 20 to 40% lipids (Phospholipids- cephalin, lecithin and sphingomyelin etc., cholesterol and galactolipids) and 60 to 80% proteins. The proteins are highly asymmetrical in their organization. For example, in the erythrocyte membrane, every protein constituent is asymmetrically distributed. Among the several proteins, “Glycophorin” is a major protein in the spans the membrane. 60% of the glycophorin molecules are carbohydrates. The COOH- end of the molecule interacts with the lipids of the membrane; its NH2- end has the attached oligosaccharides and is exposed to the external environment. Glycophorin contains the antigenic determinants for the ABO blood groups, the influenza virus, phytohaemagglutinin, and wheat germ agglutinin. Robertson postulated, in 1959, the unit membrane model on the basis of the early observations on the electron microscopy of the plasma membrane: two outer dense layers of 20nm each, and a middle layer of about 3.5nm. This trilaminate structure was interpreted by him to be the fundamental organization of many kinds of intracellular membranes-the central layer corresponding to the proteins of the Danielli-Davson model. This model of Robertson is now considered to be an oversimplification and the unit membrane is artifactual. The biological membranes are quasi-fluid structures; the lipids and the integral proteins are able to drift about laterally in the plane of the membrane. Some of the functions of the protein constituents of the membranes are given below. A protein that spans the membrane may provide a hydrophilic channel across the membrane that is selective for a particular solute. Some transport proteins hydrolyze ATP as an energy source to pump substances actively across the membrane. A protein built into the membrane may be an enzyme with its active site exposed to substances in the adjacent solution. In some cases, several enzymes are ordered in membranes as a team that carries out sequential steps of a metabolic pathway. The portion of a membrane protein exposed to the outside of the cell may have a binding site with a specific shape that complements the shape of a chemical messenger, such as a hormone. If the receptor protein spans the membrane, the external signal may induce a conformational change that activates the portion of the protein facing the cytoplasm to initiate a chain reaction of chemical changes in the cell. Membrane proteins of adjacent cells may be hooked together in various kinds of intracellular junctions. 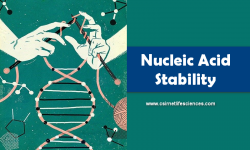 Actin microfilaments or other elements of the cytoskeleton may be bonded to membrane proteins, a function that is important in maintaining cell shape and fixing the location of certain membrane proteins. Their function is to increase the absorptive area. They were discovered by Yamada (1955). They are the blind in pushings (cave-like invaginations). They may be bigger, more or less tubular or round. They also increase the absorptive surface area. 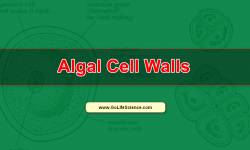 They are specialized areas of cell surface which serve to bind the surface to other adjacent structure, just like a cementing substance. These were first observed by Tangel (1879) and named by Strasburger (1812). Sometimes cells are joined by cytoplasmic bridges passing between the pores of plasma membrane or cell wall between the adjacent cells; such type of connections is called plasmodesmata. These are meant for the transparent of material from one cell to the other. Sometimes, different cell organelles like endoplasmic reticulum etc. also participate in transportation. It is the membrane of the vacuoles which is peculiar to plants. 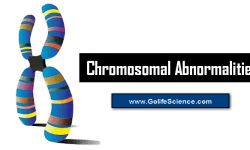 It is semipermeable in nature and perhaps originated from Golgi body or ER. Regarding the functions of the plasma membrane, besides being a protective boundary to the cell, it is involved in the selective permeability of ions and molecules across it-from the cell to the exterior and vice versa. Transport across the membrane can be passive or active. Passive diffusion: The passive diffusion of the substances can take place from a region of higher concentration to one of lower concentration and electrical gradients. The passive transport across the membrane can take place by diffusion or osmosis (which is a special case of passive transport) this does not involve the expenditure of energy – ATP. The permeability obeys only physical laws. Cotransport is a mechanism in which a single ATP-powered pump (which transports a specific solute) indirectly drives the active transport of several other solutes. A substance that has been pumped across a membrane can do work as it leaks back by diffusion. This is analogous to water that has been pumped uphill and perform work as it flows back down. Another specialized transport protein, separate from the pump, can couple the “downhill” diffusion of this substance to the “uphill” transport of the second substance against its own concentration gradient. Large molecules, such as proteins and polysaccharides, generally cross the membranes by exocytosis and endocytosis. In exocytosis, the cell secretes macromolecules by the fusion of vesicles with the plasma membrane. In endocytosis, the cell takes in macromolecules by forming vesicles derived from the plasma membrane. During exocytosis, a vesicle, usually budded from the endoplasmic reticulum or Golgi complex, is moved by the cytoskeleton to the plasma membrane. When the vesicle membrane and plasma membrane come into contact, the lipid molecules of the two bilayers rearrange themselves, and the two membranes then fuse to become continuous; the contents of the vesicle spill to the outside of the cell. The steps are reversed during endocytosis. A localized region of the plasma membrane sinks inwards to form a pocket.as the pocket deepens, it pinches into the cytoplasm from the plasma membrane, forming a vesicle containing the material that had been outside the cell. The endocytosis is the three types. Receptor-mediated endocytosis is very specific. Embedded in the membrane are proteins with specific receptor sites exposed to the extracellular fluid. The receptor proteins are usually clustered in regions of the membrane called coated pits; these pits are lined on their cytoplasmic side by a fuzzy layer consisting of a protein “Clathrin”. The extracellular substances that bind to the receptor are called “Ligands” (A ligand is a molecule that binds specifically to the receptor site of another molecule.) when appropriate ligands bind to the receptor sites, they are carried into the cell by the inward budding of a coated pit to form a coated vesicle.